What's the meaning of the phrase 'As mad as a March hare'? To be 'as mad as a March hare' is to be completely mad. 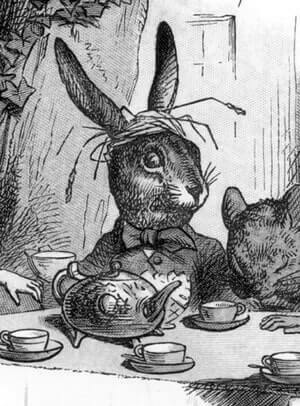 What's the origin of the phrase 'As mad as a March hare'? "The March Hare ... as this is May, it won't be raving mad - at least not so mad as it was in March." More recently this behaviour has been questioned and it is now thought that hares behave oddly - boxing, jumping etc. - throughout their breeding season, which extends over several months. Be that as it may, March hares have that 'mad' reputation, which will surely stay with them. Carroll didn't originate the expression 'as mad as a march hare'. He needed some mad characters for his story and he used one which had for centuries been referred to as mad - the March hare. "Thanne [th]ey begyn to swere and to stare, And be as braynles as a Marshe hare." "My desire is that none of you be so unadvised or harebrained as to be the occasion that ..."
"As mad not as a march hare, but as a madde dogge." The phrase has been in continuous use in the language since the 16th century. It was well-enough established by 1546 for John Heywood to include it in his collection - A dialogue conteinyng the nomber in effect of all the prouerbes in the Englishe tongue. See other 'as x as y similes'. See 'as mad as a hatter'.